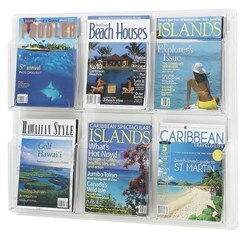 9 pocket rack attractively displays magazines and catalogs in your office, showroom or reception area. 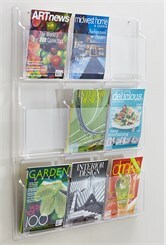 Made of optically clear, break-resistant acrylic plastic. Pockets are 8-1/2" x 11" and hold up to 1-7/8" of material. 29-7/8"W x 36-7/8"H overall. Mounting screws and anchors included. PRICE INCLUDES SHIPPING! ALL SIZES IN STOCK! 6 pockets in three columns of two. 29-7/8"W x 24-5/8"H. PRICE INCLUDES FREIGHT! 12 pockets in three columns of four. 30"W x 49-7/8"H. PRICE INCLUDES FREIGHT!